Flux-cored arc welding (FCAW) is a common arc welding process. FCAW requires a continuously fed consumable tubular electrode containing a flux and a constant voltage or, less commonly, a constant current welding power supply. The use of an externally supplied shielding gas is optional creating the primary process variation: * FCAW-S (self-shielded or “open-arc”)* FCAW-G (gas-shielded). MIG (Metal Inert Gas Welding) is a common arc welding process. MIG require continuously fed wire electrode in wire form & constant voltage supply. It requires an externally supplied shielding gas. Metal parts often fail their intended use not because they fracture, but because they wear, which causes them to lose dimension and functionality. Hardfacing, also known as hard surfacing, is the application of buildup or wear-resistant weld metal to part’s surface by means of welding or joining. Reduces Cost: Restoring a worn part to “as new” condition generally cost between 20-70% of a brand new replacement part. Prolongs Equipment Life: Service life increases of 3 to 10 times are common with properly overlaid parts. Reduces Downtime: Parts last longer and fewer shutdowns are required. Less Spare Parts Inventory: There is no need to keep numerous spare parts when worn parts can be rebuilt. What base metals can be hardfaced? Carbon and low-alloy steels with carbon contents of less than 1 percent can be hardfaced. 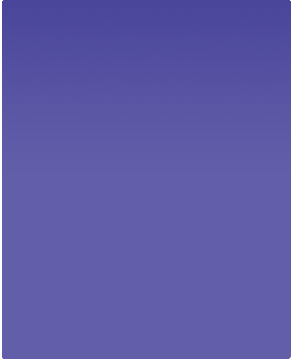 High-carbon alloys may require a special buffer layer. Note: It can be seen that FCAW has highest deposition rate among all common processes. FCAW/MIG is used for all Overlaying, Hardfacing & Cladding applications. Typical application area of the FCAW/MIG technology are extruding machine screws, valves, valve seats of internal combustion engines (motorcar, marine, locomotive etc. 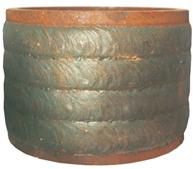 ), accessories for ships, petroleum chemistry and power generation, cutting tools (milling cutters, broachers, knifes), Equipment for mining, crushing, rolling, road building and tunneling, Process equipment in ceramics and cement production, Molding and forging dies, Pulp and paper industry equipment, Agricultural equipment, parts for nuclear plants, parts for chemical plant. It is a process which can be very easily automated to the highest degree, as compare to any other welding process. Deposition efficiency & deposition speed is very high. FCAW used spray transfer for deposition of metal to job. All the above results in a very low deformation in the job. It is possible to add alloys through the core (flux) to give the final desire composition. It is possible to work on site / outdoors. For precision cutting of Stainless steel, Aluminium and all other Ferrous and Non-ferrous metals. Stainless Steel cutting upto 150 mm thick plates. 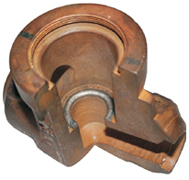 (PTA) for Hardfacing / Cladding / Reclamation & Protection of Mechanical parts. With built-in Pilot arcing system. Light weight & compact : 80% less weight compared to conventional machines. 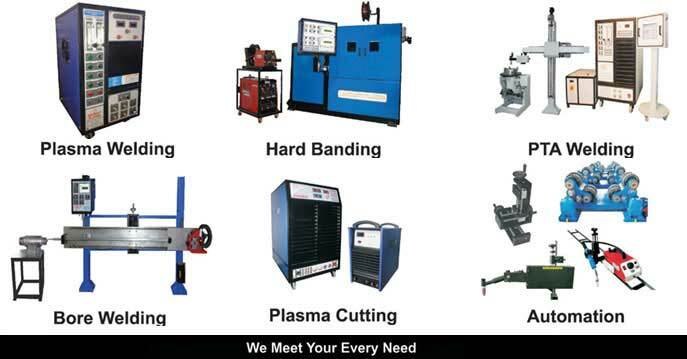 Plasma Welding, Plasma Transferred Arc Welding (PTA), Plasma Cutting Machine, Micro Plasma Welding Machine, Micro Tig Welding Machine, Hard Bander, welding inverter, welding automation, hard banding machine, welding positioners, welding ocillators mumbai, india. 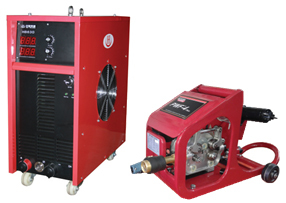 manufacturers, suppliers and Exporter of AC Welding Machines, Mig welding Machines, Shape Cutting Machines, Special Purpose Machines for hardfacing and cladding. mumbai. india.